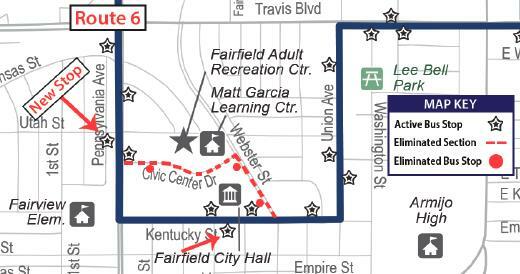 The Route 6 will no longer service Civic Center Drive & Webster Street. Sorry for any inconvenience. Questions? Please call FAST Administration at (707) 434-3800 or FAST Dispatch at (707) 422-2877. ¿Necesita ayuda con el idioma? Llame a las oficinas administrativas de FAST, al 707‑434‑3800 al depacho de FAST Dispatch al 707-422-2877 para ponerse en contacto con un intérprete. Nangangailangan ba kayo ng tulong na pangwika? Mangyaring tumawag lamang sa Administrative Office sa 707-434-3800 o sa FAST Dispatch sa 707-422-2877 upang makonekta sa isang tagapagsalin.